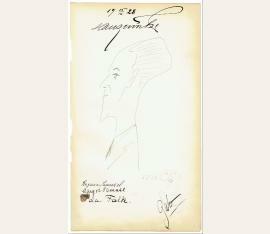 Bildhauer, Maler, Architekt und Designer (1890–1977). Eigenh. Bleistiftzeichnung mit U. O. O. 1 S. Schmal-Folio. Naum Gabo (1890–1977), Bildhauer, Maler, Architekt und Designer. E. Bleistiftzeichnung mit U. O. O., 25. Oktober 1928. 1 S. Schmal-Folio. 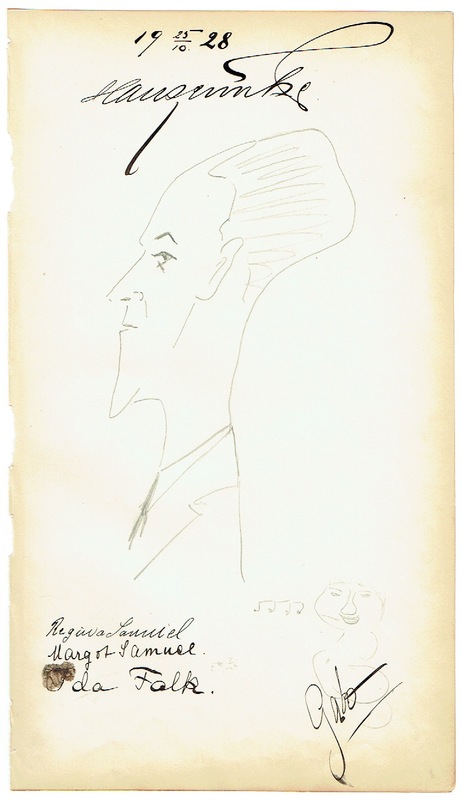 – Portrait im Profil eines Hans Emcke, signiert „Gabo“. – Mit drei weiteren U. von Regina und Margot Samuel und Ida Falk sowie mit einer kleinen Bleistiftskizze eines Frauenkopfs mit Noten. – Papierbedingt leicht gebräunt und mit kleinen Läsuren am linken Rand; in einer Unterschrift ein größerer Tintenklecks. Bildhauer, Maler und Architekt (1890-1977). 4 autograph letters signed. New York. 4to. 12 Seiten. Mit Beilagen. To Alexander Dorner (former curator and head of the Kestner Society, who was living then in Providence, Rhode Island), announcing a visit at Providence, sending a sculpture, asking for some thoughts on a newspaper project, reporting from an exhibition that had ended even now (“Nothing sold. - No money“, transl. ), and on some articles for publication. Again and again, Gabo describes the difficulties of exile: "[...] Well, life still goes on, although a lot of things are different. One is pessimistic, and the future looks quite dark. Therefore, art sells as well as not. Hard, very hard times [...]” (transl.)“. 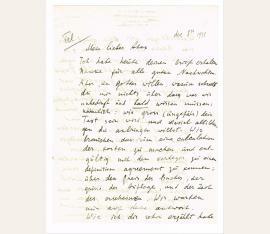 - In his letter from December 8, Gabo is describing in detail the preparation of Dorner’s publication on Gropius. 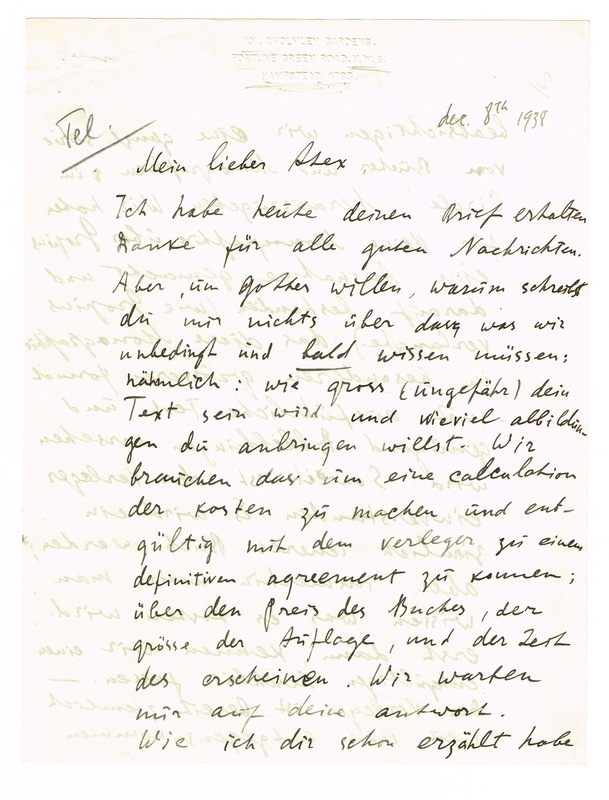 - Accompanied by 1 typed letter by Gabo, and 3 from his wife Miriam, all signed, 1953–1956..
Naum Gabo (1890-1977), Maler u. Bildhauer. Ms. Brief m. e. U., Middlebury, 13. Februar 1977, 1 Seite 4°. An den Kunsthistoriker Siegfried Salzmann (1928–1993): “[…] Your idea of arranging a comprehensive exhibition of my work is agreeable to me but an exhibition of my work, […] is a complicated enterprise and I will co-operate with you provided I know the details of your plans. 1- Who will take responsibility of insurance and transport […] 2- Are you intending to make the exhibition in your Museum alone […] 3- Can you guarantee that some of the work will be bought, either from your Museum or some other of the participating Museums? 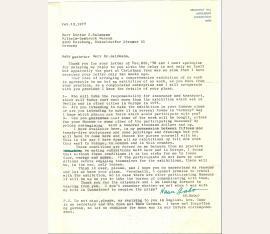 My prices are begining with a hundred thousand dollars and up […]” – Siegfried Salzmann war von 1971 bis 1984 Direktor des Wilhelm Lehmbruck-Museums in Duisburg und anschließend bis 1993 Direktor der Kunsthalle Bremen.